Treatment of ringworm (tinea corporis, tinea cruris and tinea pedis) caused by dermatophytes such as Trichophyton (e.g. T. rubrum, T.mentagrophytes, T.verrucosum, T.biolaceum), Microsporum canis, and Epidermophyton floccosum. Cutaneous candidiasis. White coloured smooth and soft cream filled in tube. 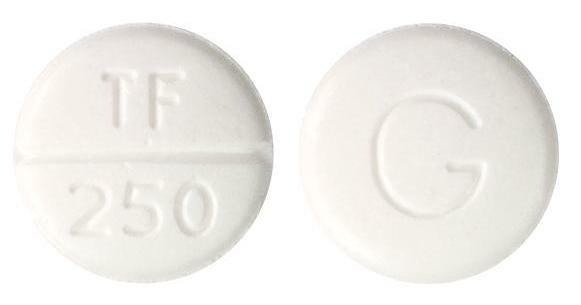 White to off-white, round, uncoated, scored, biconvex tablets with "TF" over a break-line over "250" on one, and "G" on the other.